Nibblet loves exploring. Even in purses! Here she is having some free time on the counter. Got any snacks in here? Actually, you are 100% right! She was cleaning up her face. Although I can't remember what she was eating. Hmm... I need a friend like this to help me scout for treats... WOOF! Nothing beats a good bag snoop. Have fun Nibblet. Have a wonderful Wednesday and stay cool. I didn't know you had a rat. Does Shiner usually go after it? Hey Jane - no Shiner likes to play with her :) They are good friends! That's cute! I hope visitors don't mind! Thanks Clowie, the visitor's purse is just my mom's and she doesn't mind. She is so cute! Makes me miss mine. Oooh, if Nibblet finds some good treats I hope she shares! You know it's surprising but she never poops outside of her cage. What kind of dog is Nibblet ;-) ? Oh I will Miss Dolly! Just read about it and it certainly is fabulous! I guess that Nibblet is potty trained, although I never really trained her. It's like she just knows not to go potty outside of her cage. The perfect size to be a bag sleuth!! Cute! I hope she doesn't leave presents in your purse. Or stowaway. 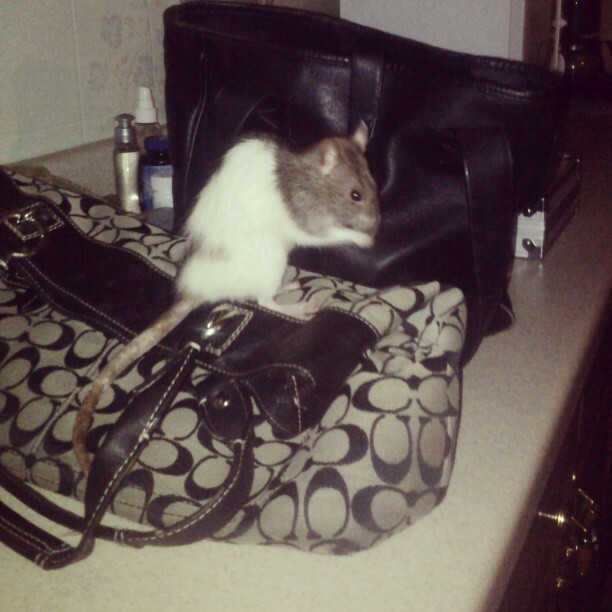 My daughter suggested that we take her somewhere with us in my purse lol.. I'm not sure how that would work out because she doesn't hold still for very long. Nibblet, you are such a cutie! Oh my! I would be afraid of what she could get into in my purse. M&M's anyone? I bet she can get in and out of lots of places cause she is so tiny. Nibblet is a cutie! Since we have guinea pigs and a gerbil ma says we can't have anymore pets but I think a rat would be really cool. Oh I didn't know you guy had a gerbil. But yes, they make really awesome pets! What a cute little nosy beastie! LOL!Looks like he looooves exploring. Do you have to be extra careful not to step on him? Hey CK - yes we do. Just like a little dog, she will get under your feet so I'm always paranoid about it. Anytime she's on the floor I make sure everyone knows about it and find myself constantly saying "Nibblet's under your feet". I mostly let her on the floor if it's just me in the house to reduce her risk of being stepped on. Or she just gets on the counter top to play.